If you have suffered a serious burn injury, Houston Burn Injury Lawyers are here for you. They have expertise in handling personal injury cases, and, specifically, burn injury cases. They can guide you through all aspects of a burn injury claim, whether you choose to settle or pursue your case to trial. Call a burn injury attorney today. Houston Burn Injury Attorneys know that even a relatively minor burn can be extremely painful and impact your life, but where they can make the most difference is with the more serious burns. When burns are severe, they can require expensive surgeries, and even then, they will most likely leave the burn victim with scarring, which can impact their physical appearance and emotional state. Houston burn injury lawyers have experience handling burn injury claims of all types, and understand that a burn injury victim may be going through one of the most difficult experiences in his or her life. Because Houston Burn Lawyers know how serious a burn can be, they will help you get quality medical attention from a burn specialist and help you document your injuries so that you can get the monetary compensation you deserve. Houston Burn Injury Attorneys know that money can't repair your injuries, but that it also can go a long way in getting you and your family back on the road to recovery after a severe burn injury. First degree burns are the least severe burns. They affect the epidermis, appear red, feel dry and can be painful for a short period of time. Though the least severe of the burns, first degree burns may still be the basis for a burn injury lawsuit. More commonly, first degree burns can be part of a lawsuit including other types of injuries. For example, if you were injured in a car accident and suffered a variety of types of injuries, including first degree burns, your lawyer might seek damages for your first degree burn injuries in addition to your other injuries. 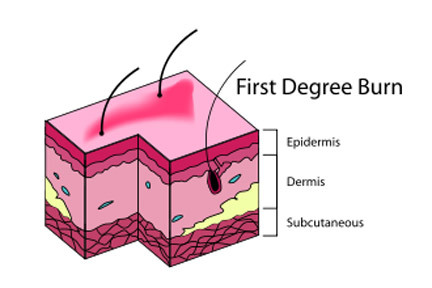 Second degree burns are known as “partial thickness burns.” They extend past the epidermis to the dermis underneath. They are known by their red, blistered appearance and moist texture. 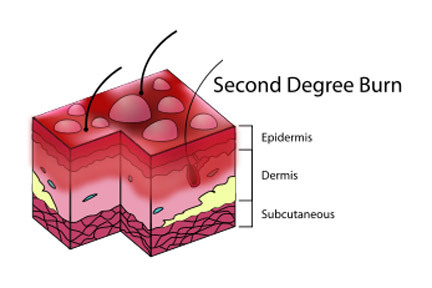 Second degree burns can cause a great deal of pain, and often lead to extensive scarring. Common causes include scalding liquids, car accidents, and other causes. 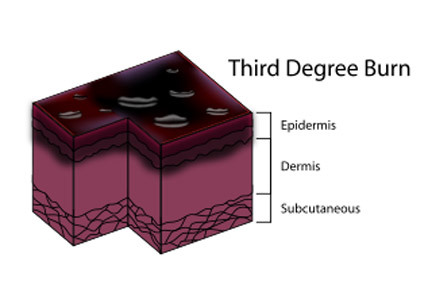 Third degree burns, also known as "full thickness burns," are very severe and extend through the entire dermis. They are stiff and brownish-white in appearance, and leathery in texture. They are extremely painful, require excision, and almost certainly lead to scarring, contractures and even amputation in the most serious of cases. They may require extensive medical treatment and are very painful, debilitating, and expensive injuries. Many third degree burns are caused by fires, hot liquids, radiation burns, electrical and chemical burns. Fourth degree burns are the most severe burns seen at the offices of Houston burn injury lawyers. They are life threatening, and the injury often reaches to the bone. They are black in appearance, dry, and extremely painful. Amputation is often required and hospitalization is a must. If you or a loved one has suffered any degree of burn, do not hesitate to contact an experienced Houston burn injury lawyer today for a full discussion of your rights. Serving clients throughout Southeast Texas, including Aldine, Baytown, Bellaire, Beaumont, Channelview, Cloverleaf, Conroe, Deer Park, Friendswood, Galena Park, Galveston, Hedwig Village, Highlands, Hilshire Village, Humble, Jacinto City, Katy, League City, Magnolia, Mission Bend, Missouri City, Pasadena, Pearland, Porter, Sealy, South Houston, Spring Valley, Stafford, The Meadows, The Woodlands, Waller and West University. Houston Burn Injury Lawyers have experience dealing with burn survivors and can help you get the medical attention you need, document your injuries, and pursue your legal claim to get you the compensation you deserve. Contact one of the Houston, Texas Burn Injury Attorneys on this site today for advice on your burn injuries.